The results and list of passers of the March 2018 Pharmacist board exams including the top 10 examinees, top performing schools and related announcements are available at this website as the Professional Regulation Commission (PRC) officially releases the results online two (2) working days after the last day of board examinations. As announced, 1,695 out of 3,039 successfully passed the exams. The March 2018 Pharmacist licensure exams are administered by PRC Board of Pharmacy headed by its Chairman, Ms. Adelina C. Royo and its members, Dr. Mildred B. Oliveros and Mr. Anthony Aldrin C. Santiago on March 7-8, 2018 at PRC testing centers in Manila, Baguio, Cagayan de Oro, Cebu, Davao and Iloilo and Zamboanga. The schedule of online appointment for issuance of Professional ID and Certificate of Registration will be announced from March 15-21, 2018. As per Resolution No. 2017-1068 entitled "Schedule of Licensure Examination for Year 2018", the target release of March 2018 Pharmacist board exam result will be on March 13, 2018 (Tuesday) or three (3) working days after the last day of exams. However, the above-mentioned date is not final as PRC may also release the Pharmacist official results earlier or later than the stipulated date without prior notice. Just keep tuning-in at at this article for timely updates. On the same exams conducted by PRC on September 2017, results were released after four (4) working days. On March 2017 and September 2016, results are out after three (3) working days while two (2) working days during August 2017 and March 2016. 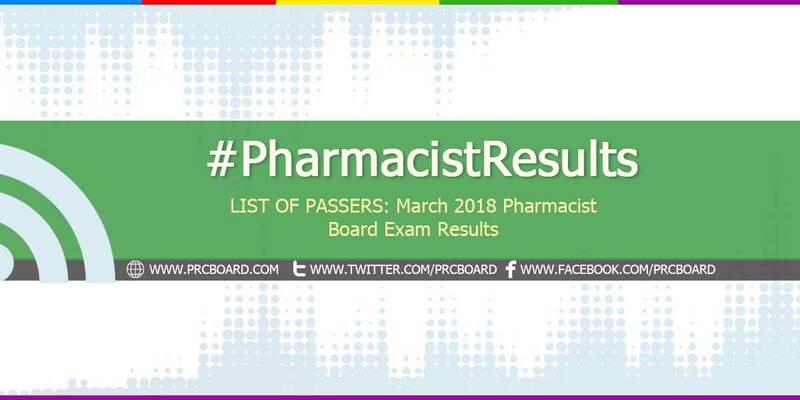 The March 2018 Pharmacist board exam covered topics from Pharmaceutical Chemistry (20%) which includes Inorganic Pharmaceutical and Medicinal Chemistry, Organic Pharmaceutical and Medicinal Chemistry and Qualitative Pharmaceutical Chemistry; Pharmacognosy (15%) which includes Plant Chemistry and Biochemistry; Practice of Pharmacy (17.5%) which includes Compounding-Dispensing, Clinical/Hospital Pharmacy and Pharmaceutical Calculations; Pharmacology-Pharmacokinetics (15%) which includes Toxicology, Incompatibilities and Adverse Drug Reactions; Pharmaceutics (17.5%) which includes Manufacturing Pharmacy, Pharmaceutical Dosage Forms, Physical Pharmacy and Jurisprudence and Ethics; Quality Assurance and Quality Control (15%) which includes Drug Testing with Instrumentation and Microbiology and Public Health. Pharmacy is one of the programs with average number of examinees being administered by PRC. In the most recent Pharmacist exam conducted August 2017, 2,784 out of 5,079 examinees passed. Jannylene Rose Tolentino Chua from University of San Carlos (UC) ranked first in the exams garnering 91.10% rating followed by Kimberly Tan Lomantas from University of the Immaculate Conception - Davao having 91.05%. Saint Luis University ranked first in the top performing schools' list having 97.27% overall passing rate followed by University of Santo Tomas (UST) garnering 92.50%. During March 2017 Pharmacist board exam, 2,426 out of 3,732 examinees passed. University of the Philippines - Manila ranked first in the top performing schools' list having all of its 54 examinees passed or 100% overall passing rate. Rhys Jansen Tiu Pavon and Ser Loisse Rodriguez Mortel, both from UST got the first two spots having 94.73% and 93.70% respective ratings. On the same exam conducted June 2016, 1,406 out of 2,784 examinees passed. San Pedro College - Davao City was the top performing school having 104 out of 118 examinees passed or 88.14% overall rating. Meanwhile, John Bryan Guadalupe Ruba from University of the Immaculate Conception - Davao ranked first garnering 92.85% rating followed by Jennilyn Daza Yambao from Our Lady of Fatima University - Valenzuela having 92.80%. To receive up-to-date news about Pharmacist board exam results for March 2018, we advise our visitors to bookmark this page, visit PRC official website or follow us at our social media pages via Facebook and Twitter. God is in control. The only thing we can do is trust Him. please God let my girlfriend pass this test.